Create memos anyone would be glad to receive with Canva's collection of templates and online editing tools. Memos are an important piece of company communications that to this day remain indispensable. They’re a lot less disruptive than holding a company wide meeting plus it’s how a company can formally announce policy changes, issue reminders and action requests, while providing or seeking a response. Although short, they are highly informative and even follow strict formatting guidelines. While you want your memo to be straightforward and no-nonsense, that doesn’t mean that it has to look boring. 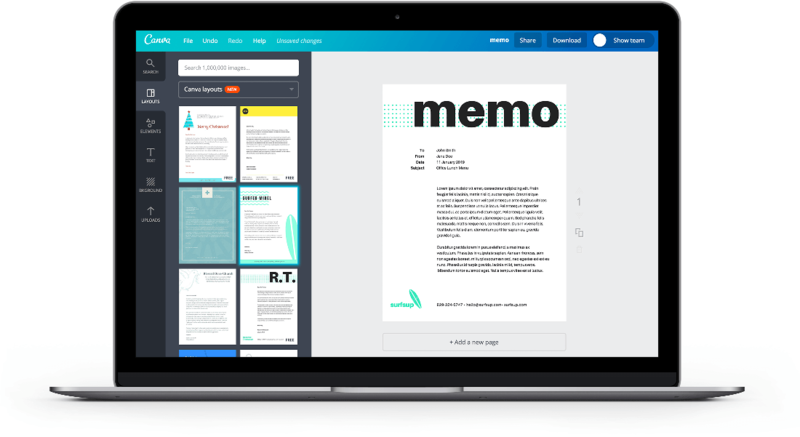 When you create your memo through Canva, you have the advantages of using professionally-designed templates that you can customize to perfectly suit your needs and your brand’s personality. Create a new Canva account to get started with your own Memo design. Memos, especially business memos, need to follow a very specific format. Starting from a header, subject and recipients, opening summary, discussion points, action points and ending with a closing statement. Easily format your memo by using Canva’s text tools. Add headers, subheadings and body text with one click then choose your font type and color. Add emphasis to your headings or important sections through font size or choosing from text formatting options like bold, underline or italics. Ensure that your memo is properly branded and easily recognisable by adding your own brand assets into the design. Uploading your own logo is as easy as dragging and dropping a JPEG, PNG or SVG version into your Canva workspace. Once uploaded, it will remain in your uploads folder for future use. Canva for Work users have access to more branding tools like the the ability to create and save brand palettes, upload their own custom fonts, and share folders. Is a piece of information in someone else’s hand? Why not get their help in completing your memo? Canva makes collaboration easy. It’s a simple matter of clicking on the share button, ticking the right text box to give editing access, then sharing the newly created link with your team members. Once you’ve finalized your memo, you can easily share it with the rest of your organization by sending it as an email (just copy and paste the addresses into the provided field) or by downloading it as a print-ready PDF file. How can I add more pages to my design? Sometimes one page won’t be enough to contain your whole memo. To add more pages, simply click on the grey ‘+Add new page’ button below your design which adds a blank page. Or, to duplicate a page, click on the ‘Copy this page’ button (shown as two overlapping rectangles) found to the right of your design. You can add up to 30 pages to a design. How much does it cost to design in Canva? Designing in Canva is free! Our library of layouts has been created by awesome designers, making it as simple as a few clicks for you to create a professional design. If you use your own images in your design, the entire process will be free.